Quick... What do you think most people are eating at Chinese restaurants right now, like right now? If you said Sweet 'n Sour Pork, that is hardly the right answer. However, I do have a soft spot for this oft-ridiculed dish. The right answer is king crab. That's right, those humongous, slightly scary-looking monstrosities crammed into live seafood tanks at the front of Chinese restaurants. 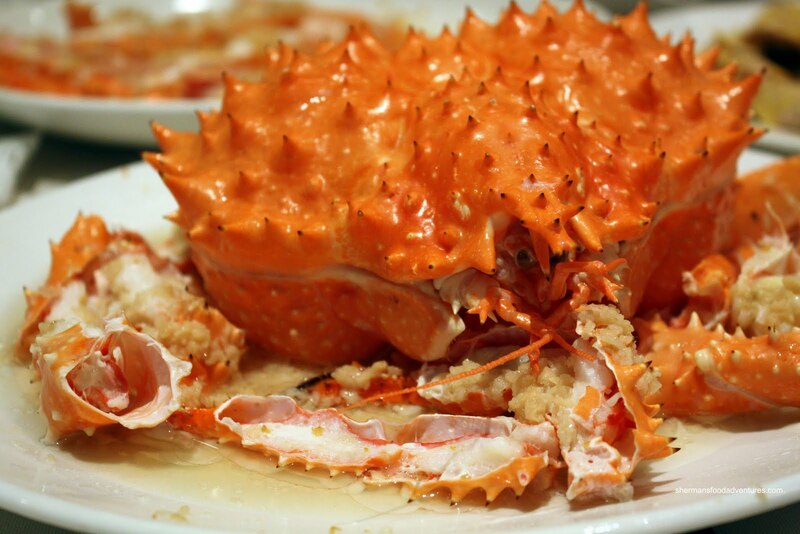 Chances are that almost every table at Chinese restaurants, that serve king crab, will be munching on crab legs doused in an obscene amount of garlic. Last year, Costanza, Elaine, Viv and I tried the king crab meal at South Ocean. It was dece nt; but I really wasn't in the mood for another 3.5 hour meal. Thus, our new destination was another Richmond restaurant - Empire. Now let's get this straight first. 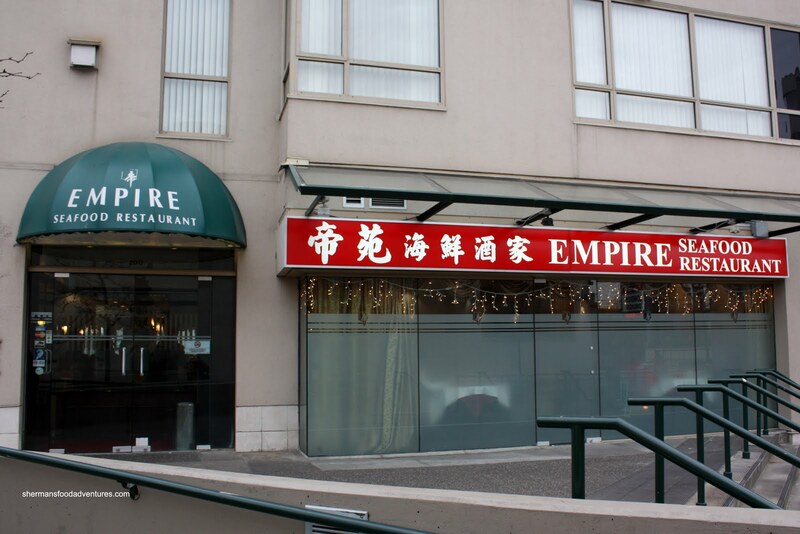 There are 2 Empire locations in Richmond. One on Alexandra and the other (which we visited today) is in the same complex as London Drugs on Westminster & #3 Road. Guess where I went first, not knowing which location Elaine made the reservation at? Yah, not only did I have to come to Richmond to eat, I had to do a bit of restaurant hopping as well. Meh, it wasn't really all that bad. I should just lay off with the Richmond jokes, the food is outstanding there. So, when we finally arrived, the restaurant was truly hopping. It was packed and barely anywhere to walk. Today, it was only my son and I joining Costanza and family. 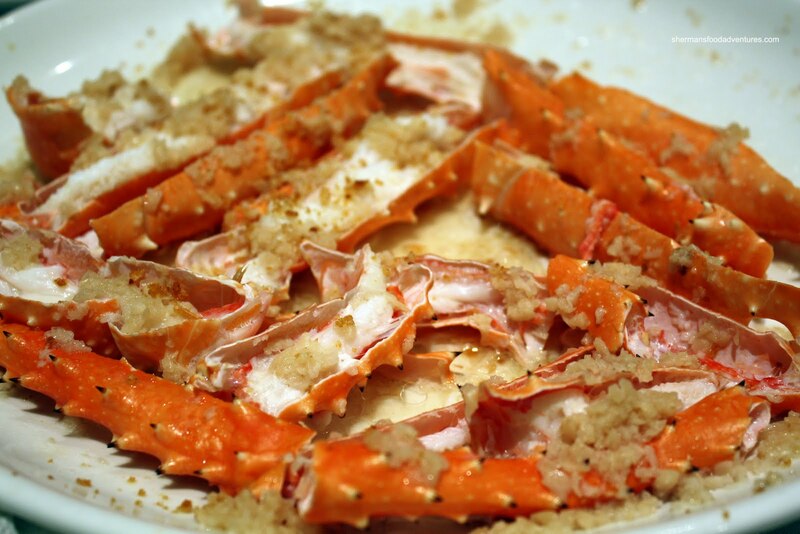 Viv was busy and I was not brave enough to bring both kids out, especially to a hands-on meal such as king crab. Ultimately, I still had a challenge on my hands since my son would probably not eat anything. We ended up ordering a set meal which included 2 courses of the king crab. 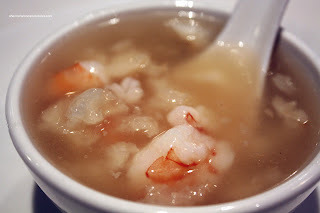 Up first was the Fish Maw with Seafood Soup. Honestly, despite the nice picture full of ingredients, the actual large serving bowl of soup had very little in the way of anything. The fact I could see large spots of broth didn't bode well for this soup. Where there was seafood, it was fabulous. However, the fish maw was diced up into little bits and barely any of it. I would definitely say this soup was a miss. The next dish was the Free Range Chicken. For me, I guess it totally depends on my mood whether I want to eat free range chicken or not. 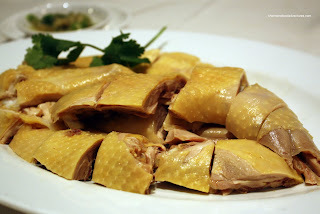 You see, this type of chicken is quite lean and the meat can be a tad chewy. Sometimes I'm in the mood for it, sometimes I'm not. I was indifferent tonight and thought it tasted alright (it had some seasoning) and the accompanying grated ginger amped it up a bit. The main star of the meal, which is the King Crab if you haven't guessed by now, was a bit of a disappointment. In terms of the garlic, it was fabulous. I kept scooping up the garlic to eat on its own. Costanza watched in disgust. Hey, I love garlic! However, the crab itself was small and appeared to be on the Atkin's diet. There was very little meat in the legs. 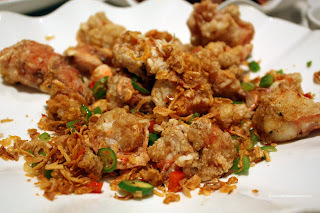 Furthermore, the 2nd crab course, which is the fried body meat tossed in chili salt, was hopelessly small. I figured that they must've used the smallest, skinniest, most pathetic crabs they got for the set meal. I realize that the set meal may work out to be slightly cheaper than ordering a king crab on its own; but somebody inform us will you? I mean, the other dishes in this particular meal were quite ordinary in my opinion. And ordinary doesn't even explain the Braised Pork Ribs. During the meal, Constanza remarked how much he enjoyed this dish. For me, I just kept quiet. Why? Because I really couldn't stand it. The darn dish was not appetizing to look at or to eat. There was very little in the way of flavour despite the appearance of braising. 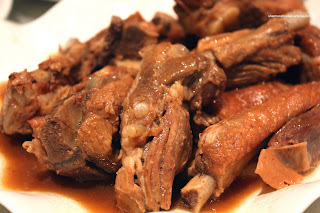 Usually, braising pork ribs would result in a very rich tasting meat. Furthermore, I found the meat to be dry and tough. Don't ask me how they accomplished this with pork ribs in braising liquid. 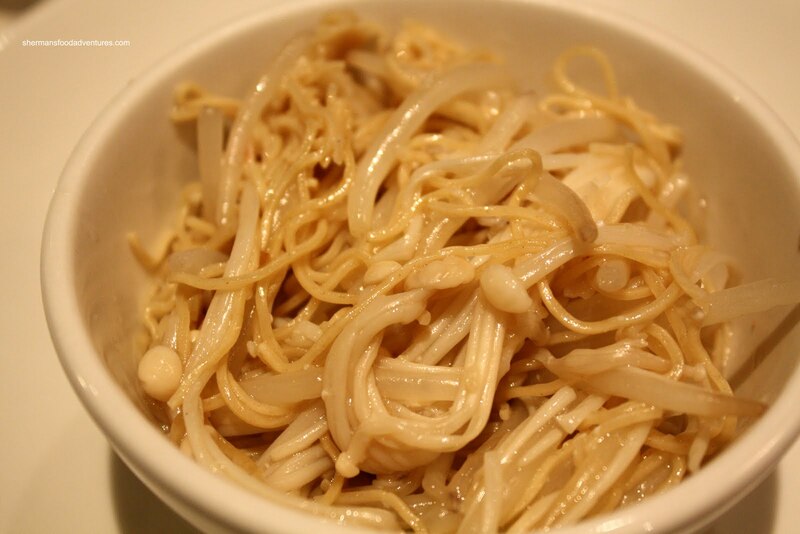 The last item in this meal was a simple dish of Egg Noodles with Enoki and Sprouts. Bland, mushy and cold, I also hated this dish. My son didn't like it a nd wanted to stop eating it. This time, I don't blame him. If you add up the 3 dishes and the pathetic soup, they were more like throw-ins than actually respectable food. Take into account the crappy crab, the meal was no way worth $128.00. Honestly, I would've gladly done the meal from last year at South Ocean instead, even if it were 3.5 hours. I wasn't impressed with my meal at Empire at all. Empire was decent maybe 3-4 years ago. Now it's totally gone down hill. They cram way too many people in there it's not pleasant (Richmond itself ain't pleasant to begin with--oh snap! J/k) and it's way too loud. Next time it's worth it to pay a bit extra and eat king crab from Kirin, where you'll know there will be huge chunks of meat! LOL demo crab! Yah, it was not a good experience at all. I did have a couple of king crab dinners last year and Victoria was great. So I agree with you about heading to a better restaurant and paying a bit more. That was such an horrible review for a restaurant, I've read many foodie bloggers review and that one was probably the most harsh one I've ever read so far... I'm never going to dine at Empire Seafood Restaurant. Thank you for your warning!!! Well Trisha, to be honest, I've heard good things about their Dim Sum, so I'm not so quick to judge on the restaurant as a whole. It's just that this meal sucked. You actually got a better deal than what I had a year ago. King Crab dinner for 4 @$148, it came with the fishmaw soup, steam and P&S King crab, half-a-boiled (BuyLow :D) chicken, bokchoi & oyster mushroom, and the same noodle. I'm looking at my photos now, and you got range-chicken. I returned a week later, and that was the straw that broke the camel's back. Never been there since. I had King crab meals as late as February and was advised that the crabs were less meaty as the season was running out. I heard a good place to have Kingcrab is at the restaurant opposite Richmond Public Market, where the price and weight are fair. 金玉滿堂 Don't know the English name of the restaurant. You know what EnbM? Other tables got much bigger crabs if they ordered it separately, which I completely understand since they would be paying more. But the crab we got was very, very small and sorely lacking meat. But as mentioned, the worst thing was the entire meal. It sucked. Yah, I definitely will go elsewhere for king crab next year. I had the exact same experience at this restaurant a few years ago. We ordered an 8 pound king crab and when it came to the table, there was barely anything! We complained but they kept giving us the run around. Next weekend we bought a 6 pound king crab and cooked it ourselves. It had 50% more meat than the "8 pound" crab at the restaurant. I do hear it is a very common practice at discount king crab restaurants.